IMPORTANT NOTE : IMANA Welcomes all its members, their families and friends to its 50th Anniversary Cruise. To be part of this group, you must register through Continuing Education, Inc./University at Sea ® at 800-422-0711 or by registering online . All registrations are subject to IMANA's final approval. Abstracts must be of interest to physicians of all specialties. No presentation will be allowed without an abstract submission. Abstracts that do not conform to the guidelines as set forth in this document may be rejected. Abstracts may be sent via paper or electronic submission (preferred). Please e-mail your abstract in an attachment to an e-mail in Microsoft Word (.doc) format. All electronic submission MUST be accompanied by a paper submission as well and must reach IMANA Headquarters on or before April 15, 2017. There will be no exceptions. Please include your CV with submission. The information requested on the abstract form and in the instructions must be included with submission of the abstract. Abstracts that are submitted to IMANA will not be returned to the author(s), even if they are not accepted. Authors will be notified of the decision on the abstract in a timely manner. Depending on number of abstracts accepted, some might be encouraged to present their presentation as poster presentation. Electronic submissions are preferred, providing the typed material does not exceed the space limitation on the abstract form. The first author will be listed as the presenter unless specified otherwise. The number of presentations allowed by each author may be limited as judged by the CME committee based on number of abstracts submitted and interests to the audience. All Fields of the Abstract must meet the requirements of the Abstract Guidelines. The abstract must be typed, single-spaced, with heading (title of paper) flush with the left margin of the abstract box. After the title, the presenting authors name should appear first (if possible) followed by names of additional authors. List no more than first two initials followed by last name for each author. Institutional affiliations (including city, state, and country) should follow the list of authors. When multiple authors from different institutions/departments are listed, each institution/department must be identified. Academic degrees are to be omitted. Charts and diagrams are not permitted in the abstract, but a simple table is acceptable providing it does not exceed the allocated space for the abstract. Font size must be no smaller than 10 point. The presenting author and necessary contact information must be identified on the abstract form as indicated, if not the first author is presumed. Authors, listed, as the CME committee will notify presenters, who submitted abstracts to IMANA, of the decision in a timely manner. The presenters of accepted abstracts will be asked to sign a statement that he/she has agreed to present the paper at the convention. Delegates whose abstracts are accepted for presentations and who fail to present or fail to arrange for a co-author to present will not be considered for future presentations at the IMANA meetings for the following two years. All delegates, including presenters, must register for the Medical Conference by completing the registration form and paying the registration fees. This activity has been planned and implemented in accordance with the Essential Areas and Policies of the ACCME and IMANA. IMANA is accredited by ACCME to provide continuing medical education for physicians. This educational activity is designated for maximum of 8 AMA PRA Category I Credit(s)™. Physicians should only claim credit commensurate with the extent of their participation in the activity. Barcelona's food is also a highlight: stop into a tapas bar and try a variety of delicacies. Standard restaurants of every style are available, too. And, there's music, too! Visit an underground jazz club or the magnificent Palau de la Música Catalana; or stop by the Palau Dalmases for a stunning, flamenco performance (it's near the Picasso museum). Did we mention art? One of the largest collections of Picasso's art is found at the Museau Picasso, and a great collection of contemporary, figurative (i.e not abstract) painting and sculpture is housed at the European Museum of Modern Art just around the corner. 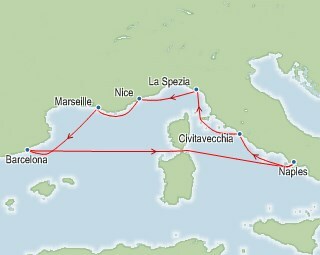 Civitavecchia (Rome), Italy - Ah, the Eternal City: Romance, culture, food, history, art and fashion. You'll have to plan your time carefully as the sights of Rome are captivating and seemingly endless: the Colosseum and Forum, the Pantheon and Trevi Fountain and, of course the Vatican and the Sistine Chapel. And, of course, there are world class museums for lovers of every art era and fine food is easily found (take a brief stroll away from the most heavy tourist areas to find the good stuff). La Spezia, Italy - In Florence view the timeless treasures: the lofty Duomo, Giotto's bell tower, Michelangelo's David, the Uffizi Gallery, Ponte Vecchio over the Arno. In Pisa, see the famous Tower, still standing, if crookedly, after 650 years. Or, you could stay closer to port and visit Cinque Terre ("The Five Cities") coast, a UNESCO World Heritage Site, and one of Italy's greatest jewels. These five small villages dotting the coast are free of car traffic and are reached only by a railway, hiking trails, or a pedestrian ferry. Small, winding paths connect many of the villages, and a light amount of hiking will afford you some spectacular views of cliffs, coastline, and stone terraces. Villefranche (Nice), France - Villefranche is your gateway to the one-of-a-kind French Riviera, home to Monte Carlo, Cannes and Nice. Shaded by jagged mountains touching deep blue shores, Villefranche offers sunny beaches, sophisticated resort cities, quaint red-roofed villages and spectacular views. 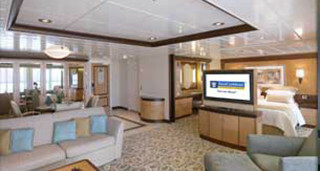 Cabin capacity ranges from 1&dash;6 guests; they are priced according to deck location and type of room. There is limited availability for cabins holding 5 guests. Please see below descriptions. 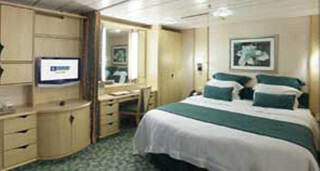 Interior Stateroom (M) - Two twin beds (can convert to a Royal King) and private bathroom. 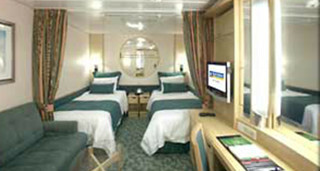 Interior Stateroom (K) Quad- Two twin beds (can convert to a Royal King) and private bathroom. 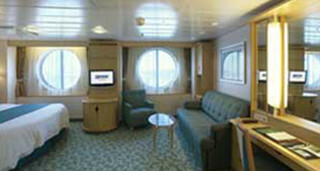 Family Interior Stateroom ( FI) - Two twin beds (can convert to a Royal King) and private bathroom. 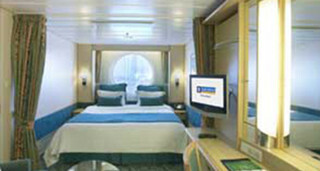 OceanView Stateroom (H) - Two twin beds (can convert to a Royal King) and private bathroom. 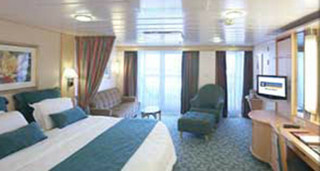 OceanView Stateroom (G) Quad - Two twin beds (can convert to a Royal King) and private bathroom. Family OceanView Stateroom (FO) Quad - All staterooms and suites come complete with private bathroom, vanity area, hair-dryer, closed-circuit TV, radio and phone. 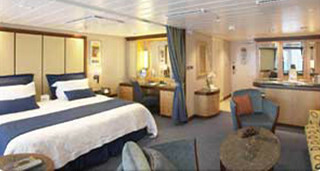 Two twin beds Royal King size bed, sofa and/or Pullman beds, sitting area and private bathroom. Family Panoramic Ocean View (PF) - Family Panoramic Ocean View Two lower twin beds that convert to Royal King. Curtained section with bunk beds. Living area with double sofa bed, vanity and sitting area. One and a half baths with shower. Floor to ceiling wrap around panoramic windows, 76 inches high by 321 inches wide. Family OceanView Stateroom (FO) Quad- All staterooms and suites come complete with private bathroom, vanity area, hair-dryer, closed-circuit TV, radio and phone. Two twin beds Royal King size bed, sofa and/or Pullman beds, sitting area and private bathroom. 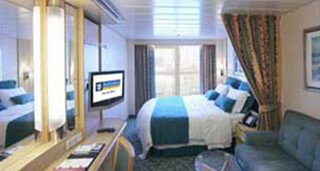 Superior OceanView Stateroom with Balcony (D1) Quad - Two twin beds (can convert into queen-size), sitting area (some with sofa bed), private balcony and private bathroom. Rates vary from deck to deck. Grand Suite (GS) Quad - Two twin beds (can convert into queen-size), private balcony, sitting area (some with sofa bed) and private bathroom. Infants sailing on a cruise must be at least 6 months old as of the first day of the cruise . HOWEVER: For transatlantic, transpacific, Hawaii, select South American and other selected cruises, the infant must be at least 12 months old as of the first day of the cruise. For the purposes of this policy, any cruise that has 3 or more days consecutive at sea will require infants to be 12 months old on the first day of the cruise. Please be aware that guests travelling with a young infant that does not meet the infant policy will be denied boarding. No refunds or other compensation shall be due from the cruise line to anyone as a result of the denial of boarding to an underage infant or other accompanying guests. Please note: An individual's age on the date of sailing determines his or her status for their cruise vacation. CANCELLATION, DEVIATION OR SUBSTITUTION BY CARRIER: a. Carrier may for any reason at any time and without prior notice, cancel, advance, postpone or deviate from any scheduled sailing, port of call, destination, lodging or any activity onboardthe Vessel, or substitute another vessel or port of call, destination, lodging or activity. Except as provided in Section 6(e) below, Carrier shall not be liable for any claim whatsoever by Passenger, including but not limited to loss, compensation or refund, by reason of such cancellation, advancement, postponement, substitution or deviation. b. 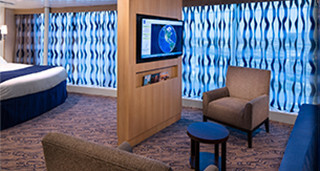 In connection with a Cruise Tour, Carrier has the same right to cancel, advance, postpone or deviate from any scheduled activity, departure or destination, or substitute another railcar, bus, destination or lodging or other component of the Cruise Tour. Except as provided in Section 6(e) below, Carrier shall not be liable for any claim by Passenger whatsoever, including but not limited to loss, compensation or refund, by reason of such cancellation, advancement, postponement, substitution or deviation. c. By way of example, and not limitation, Carrier may, without liability (except as provided in Section 6(e) with respect to mechanical failures only), deviate from any scheduled sailing and may otherwise land Passenger and her property at any port if Carrier believes that the voyage or any Passenger or property may be hindered or adversely affected as a result of hostilities, blockages, prevailing weather conditions, labor conflicts, strikes onboard or ashore, breakdown of Vessel, congestion, docking difficulties, medical or lifesaving emergencies or any other cause whatsoever. d. Carrier shall have the right to comply with any orders, recommendations, or directions whatsoever given by any governmental entity or by persons purporting to act with such authority and such compliance shall not be deemed a breach of this Agreement entitling the Passenger to assert any claim for liability, compensation or refund. 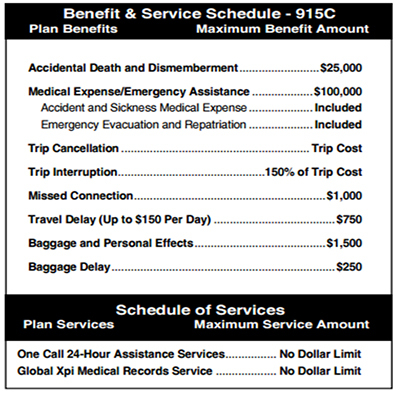 e. In the event that a Cruise (or the cruise component of a Cruise Tour) is canceled or terminated early due to mechanical failures: i) Passenger shall have a right to a full refund of the Cruise Fare if the Cruise is cancelled in full, or a partial refund if the cruise is terminated early; ii) Carrier may cover or reimburse Passenger for additional costs (e.g. airline change fees) as deemed appropriate by the Carrier. iii) If the passenger has traveled to the Vessel Passenger shall have a right to transportation (by means selected by the Carrier to the Vessel scheduled port of disembarkation or the Passenger's home city; and iv) Passenger shall have a right to lodging (selected by the Cruise Line) if disembarkation and an overnight stay in an unscheduled port are required due to the Cruise or cruise component of a Cruise Tour being cancelled or terminated early because of such mechanical failures. Cruise Line cancellation policies are strictly enforced. For that reason, we urge all of our travelers to carefully consider whether travel insurance is a good value for them. Certainly, if you have reason to think that "something might come up" that might force you to cancel, travel insurance is worth the cost of the premium. Examples we've seen in the past include ill or frail family members and changes in employment causing relocation. Located in the heart of Montjuic, one of the most cultural areas of the city. Located between the famous Plaza de Espana and Gran Via Avenue, visit the nearby Montjuic Magic Fountains, Olympic Stadium and Montjuic Castle. 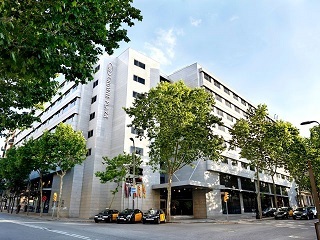 You can also spend some time shopping in the amazing entertainment centre &dash; Arenas de Barcelona. If you decide to enjoy the attractions of the Barcelona City Centre, you are only a few metro stops away. See Gaudi's impressive Sagrada Familia or spend some time among the pavement cafes and entertainers of Las Ramblas, or take a quick drive to Barcelona's beach. Ask your CEI agent for details and availability or click the links below to book. Additional - Transfer from Crowne Plaza Barcelona Hotel to the pier (July 23, 2017): $15 per person . The Granada tour is being offered and operated by Dar ElSalaam (not affiliated with Continuing Education Inc.). Please use the following link Granada to register for this tour.